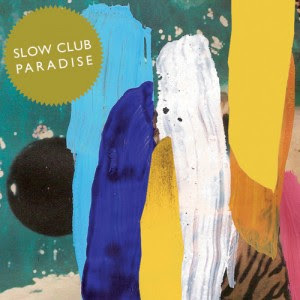 From opener 'Two Cousins' right through to the album's 'hidden' title track it's clear that Paradise is the sound of Slow Club surpassing all expectations. At the time when Slow Club were first starting up in Sheffield I was working at the Students Union where they used to play. A sound engineer friend remarked to me, about the band, that he was glad of their existence because otherwise they'd be two 'boring singer-songwriter' types rather than just one band. Always having found Slow Club to have been, at worst, rather pleasant I refrained from commenting. However that there was a grain of truth in what this sound engineer was saying shows a lot about what the band used to be. As much as they hated it, it's really no surprise that they've been called 'twee' a lot in the past. Charles was a stereotypical indiepop boy, whilst Rebecca used to play percussion on an old chair. They wrote ramshackle melodies with titles like 'Come On Youth' and 'Let's Fall Back In Love'. They were, and sorry if you're reading this guys, twee. Fast forward to 2011, Slow Club, no longer particularly affiliated with Sheffield have released what feels in every respect to be a classic pop record. Refined, but retaining the quirk and spirit the duo have always possessed it's something of a treasure with many disparate highlights coming together to form a satisfyingly complete record. Whilst 'Two Cousins' is a personal favourite there's every chance that when you approach Paradise there'll be another that you just won't be able to shake. 'If We're Still Alive' takes the more clattering approach of some of Slow Club's early material and is all the more charming for it, whilst 'Where I'm Waking' comes onto the listener in a way that's guaranteed to prick up a few, shall we say, ears. More subdued moments such as 'Hackney Marsh' and 'You, Earth Or Ash' make it feel as though sitting through Paradise is a rifle through some long lost collection of old vinyl LPs. It's new on the ears but feels very much like it could have been around forever. Whilst it's not a complaint, as such, Charles' vocal plays much less of a part on Paradise than it did on Yeah, So?. Clearly Rebecca is the central focus now and with pre-release publicity mentioning her split with Gareth Campesinos! she's clearly on her way to becoming an indiepop icon. It's not a takeover of the sound though, with Charles' musical compositions and textures proving to be the factor that keeps us coming back time and again to the album. So, yeah... time will tell if Paradise becomes the classic (cult or otherwise) that it promises to be. However if you've any sense you'll get in there now. For not only is this one of the best albums of 2011 but that way you'll still have chance to grab the bonus disc which is essential for the Arab Strab men (Malcolm Middleton &a Aidan Moffat)'s version of 'Two Cousins'. It's brill!